This is the simplest sourdough bread to make as far as ingredients: Flour Water, Yeast and Salt. It may look a bit complicated at first but this is the most basic bread making process that is in use for thousands of years.. It take 2 day from start to finish, but actual cumulative work time is less then an hour. 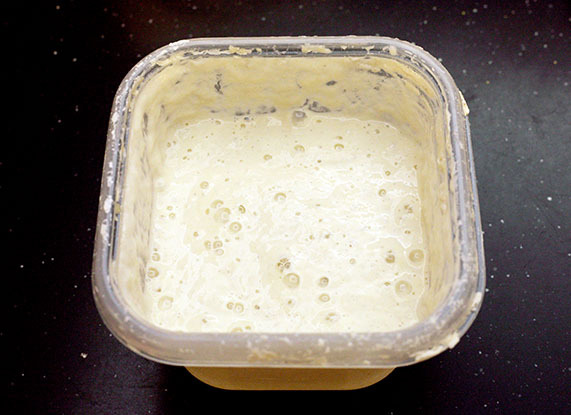 IIn a large bowl (mixer bowl or by hand) the sourdough starter with the water until the starter is fully dissolved. Add 400 grams of flour and mix well until smooth. Cover the bowl and let stand in room temperature for 8 hours (over night). I like to put it in the over with only the oven light on for a little warmth. This stage is called "making a sponge". When you uncover the sponge, it should be bubbly and frothy and smell like sourdough with a hint of alcohol. Add salt and the remainder of the flour. Mix until most of the flour has gotten wet, cover and let stand for 20 min or so. This will allow the flour to absorb the water and the dough will become easier to handle. Knead the dough for 5 minutes until it is less sticky, smooth and uniform, and can be formed into a ball. Lets stand for 5 minutes and knead some more. By now the dough will be smoother and less sticky. 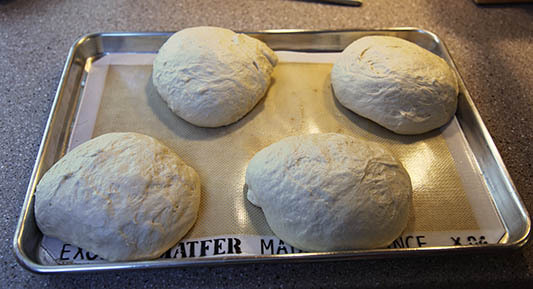 Split the dough into 4 equal parts (I use a scale) and form into 4 balls. Place on slightly oiled baking sheet and let is rise for an hour (I put it in the oven with the oven light on which makes it 80f or so) . To prevent the dough from drying out and developing a skin I also put a baking pan with a few cups of warm water in the over to make the oven humid. 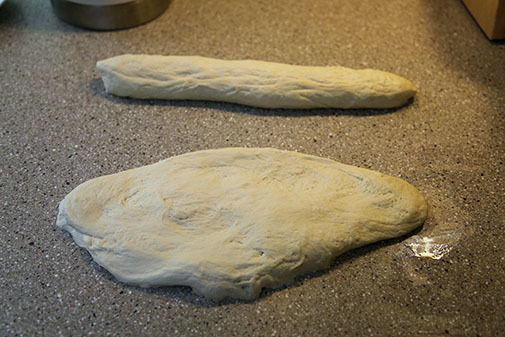 After a couple of hours, the dough will raise to almost double its original size. Take the dough out and shape it into 4 loaves of whichever shape you like (I like loaves), and place them on baking sheets or special bread forms. use a sprayer/spritzer ($1 at Costco) with clean water to keep the bread from dying out and forming a a hard skin. 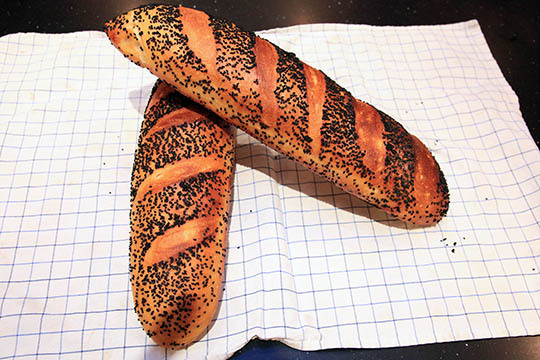 sprinkle black seeds on top of the bread (spruse a sprayer/spritzer ($1 at Costco) with clean water to keep the bread from dying out and forming a a hard skin. 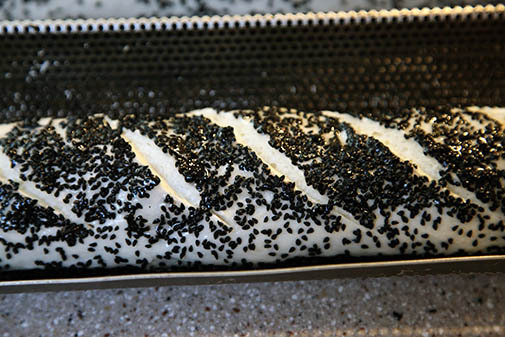 sprinkle black seeds on top of the bread (spraying the bread with a bit of water will help the seeds stick). 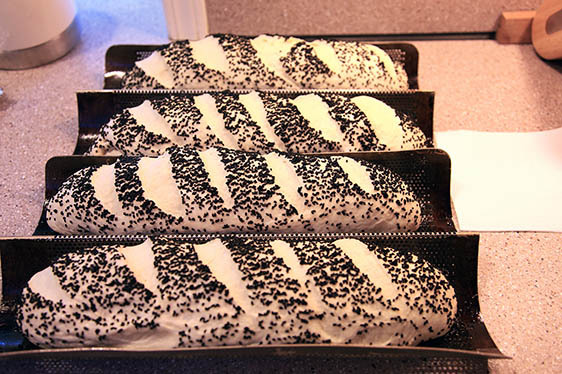 Place the bread into the middle rack of the oven with the light on. Place a small pan with hot water on the bottom rack. This will help warm up the oven to promote rising and also humidify so the dough doesn't dry.. On dry summer days remember to spray the oven lightly with water.. Remember what the bread looks like when it went in, because you need to let it triple in volume. Depending of temperature and the four types, it would take from 3 to 5 hours. Once the bread is risen take it out of the oven (remove the water pan too), and preheat the oven to 500f. Using a razor blade or a box cutter, make diagonal slashes in the bread (see photo), this will allow the bread to expand when baking. Wet the bread with the water sprayer and place it on the middle rack, try to minimize the time that the oven door is open so you don't lose too much heat..
After 4 minutes open the oven, spray the bread (and the inside of the oven) with water, and close the door as soon as you can. When the bread starts showing signs of browning (little gold patches, typically after 10-15 minutes of baking) turn the temperature down to 430f (if you have convection, switch to convection at 410f). Continue to bake until the bread is light mahogany brown but NOT burned. Take the bread out, and let it cool. It is very tempting to eat the bread warm, but sourdough tastes a lot better after 2 hours..
As I said at the introduction, this process looks long and complicated but the actual time that it takes is less then an hour over 24 hours..
when you make the sponge you can make the bread more (or less) sour by playing with the temperature. Cooler temperature (65f) promotes the bacteria the makes it sour, and warmer temperature makes it less sour but faster fermentation. If you choose to use lower temperature, you may need to add 4-5 hours to the fermentation time.. If you want to add another flavor dimension to the bread, add 2 tablespoons of brewers malt*** to the final dough mixture. You will not taste the malt in the final product but the bacteria LOVE that stuff and the flavor is amazing. If you have some coarse sea salt, you can sprinkle some on top of the bread before baking. Sourdough bread, like a car, starts with a "starter" which is made of flour, water and some luck. You need to make a starter only once, and in theory, it could last for hundreds of years. To make your own starter: Take a shallow dish with large surface area, mix 100 grams of flour* and 200 grams of filtered/bottled water (no chlorine!) and mix well until smooth. Place the shallow dish uncovered next to a window where fresh air flows and wait. Make sure to mix it well whenever you have a chance (a couple of times a day or more). If you were good and did not angry the Gods (have the right bugs floating in the air), you will get the good bugs to "infect" the dough. Sourdough is made by a yeast and a bacteria that live symbiotically in the dough. The yeast makes CO2 and Alcohol, and the bacteria (Lactobacillus sanfranciscensis) makes the acid/vinegar which gives the sourdough that tangy taste. You need to do this only once! Once you achieved a good culture you can propagate it for years, and in theory, forever..
Once the starter is bubbling and creating some foam, add 100 grams of flour and put it in the refrigerator in a plastic container. Remember to "feed" the starter every week. a couple of tablespoon of flour and water, mix, and it’s good for another week.. When feeding the starter ALWAYS add equal amounts of water and flower (by weight) to keep the ratio of flour to water at 100%.